In the past I have run a CVA Apex muzzle loader and have been fairly pleased with it. It is lightweight and will easily hit a deer within 100 yards and has been very reliable. 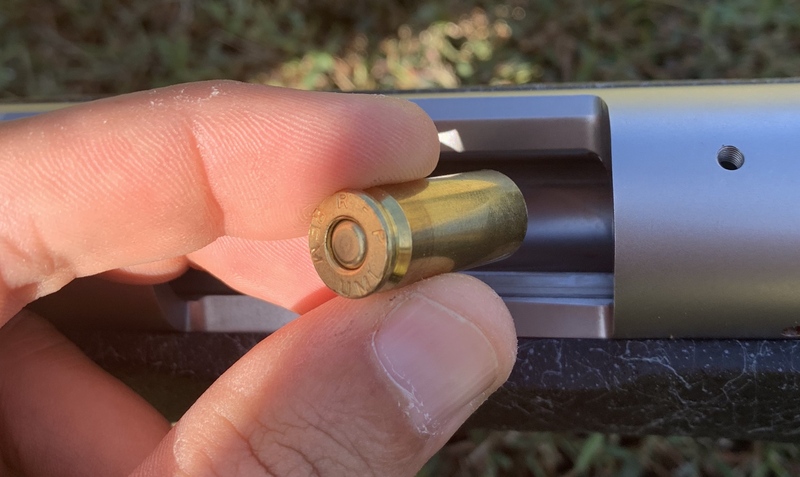 It will typically hold about 1.5" at 100 after the clean bore shot up until about 10 rounds at which point it falls off and needs to be cleaned again. Last year I decided I wanted to get into a nicer, better shooting muzzle loader. I talked with Greg and Travis about a full custom, but they quickly talked me out of that. It would just be so much money and still would be very limited to effective distance. I wouldn't be gaining much for the thousands that would be spent on it. When SilencerCo came out with their maxim 50 I bought one of those. A suppressed muzzle loader was definitely a plus. It was about as quiet as my 308 through the thunderbeast so suppression worked well. The problem with the maxim 50 is that it is very limited as to bullet choice and I had trouble getting any of them to shoot well. I mean...I couldn't keep it on a poster board at 50 yards. I sent it back to Silencerco and they said they fixed it and shot test targets for me, but at that point I was very frustrated with it and just sold it. Limited bullet choice, short barrel, low quality host muzzle loader just wasn't working for me. A few weeks ago, after much reading and deliberation I bought a Remington Ultimate Muzzle loader. 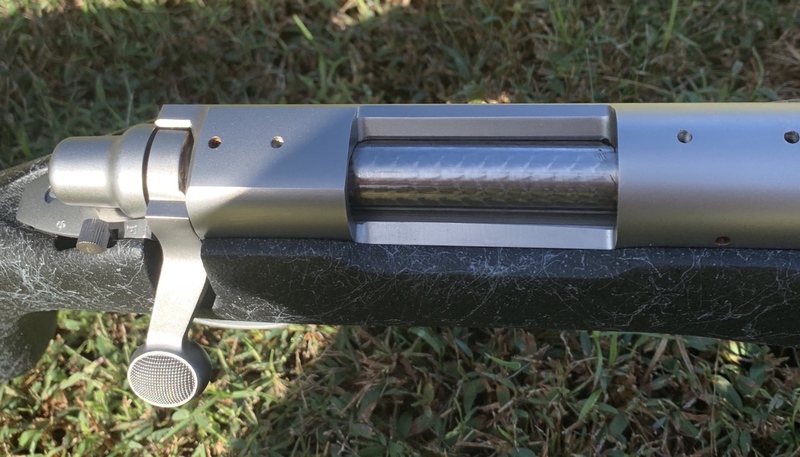 It is a far cry from a full custom, but it is one of the nicest factory muzzle loaders I have seen. 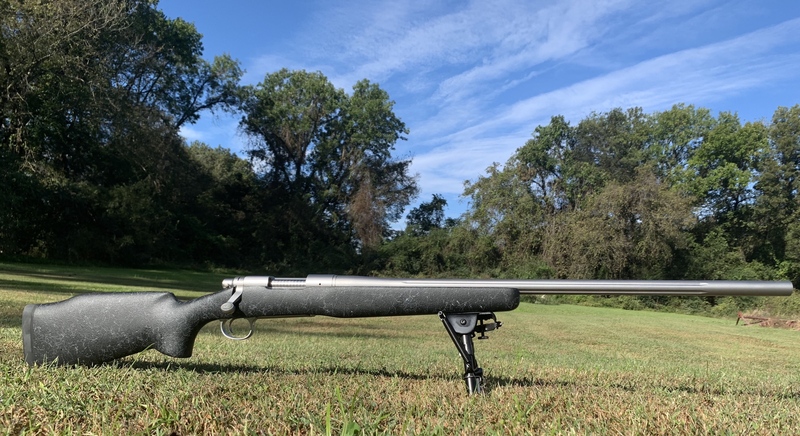 It is built on a Remington 700 action and as such it can accommodate 700 triggers, stocks, and scope mounts. It comes in a B&C stock which isn't top notch, but is better than most 700's come with from the factory. It uses cut off 308 brass with a magnum rifle primer for ignition. This system seems much better thought out than fiddling with 209 primers. It is a single shot action which I don't like. I wish it could mag feed the primer brass as that would make it easier. It uses a standard 308 bolt but has the ejector removed so that it won't drop the reusable brass on the ground. I might buy and put an ejector back in it to eliminate a step in reloading it. 308 brass is easy enough to find without having to pick up the empties when hunting. I removed the barrel band and will not be using the ram rod holder on this rifle. without the ramrod holder and barrel band the barrel will float which should be better. I don't mind carrying my ram rod separate. The scope base should be arriving today and I intend to shoot it in the next few days. If it shoots acceptably, I will put a trigger tech trigger on it and put an awesome cerakote paint job on it. It will also get an atlas rail and bipod before season starts. Then next year it will get an adjustable stock. I am spoiled with my adjustable stocks and if I like this muzzle loader it needs one too. It is not a full custom, but it is much cheaper and is still much nicer than the CVA. I'll post back here as I shoot it to let you all know how it goes. I’ve kind of wanted one of these just because it uses regular stocks and you can free float it. I’ll be curious to see how this ends up for you, what powder do you plan on using? I have used 777 pellets for about 10 years now. Remington recommends them. I hope they work because I like them. This rifle can handle up to 200 gr. of 777! I will probably only run 150 gr. as it will get the job done just fine. I might try 200 gr though...but I bet it kicks like crazy. I’ve had good luck with the triple 7 pellets, I just don’t like how dirty they get, so last year I switched to bighorn 209 and never got a shot off at anything, worked great at the range, I bet I fired over 20 shots before cleaning and could have went longer. I have a pound of blackhorn 209, but haven't tried it. 777 is a little dirty, but nothing like old school goex. I’ve never shot that so I’ll take your word for it. I was always bothered by having to clean triple 7 (even though with the sabots I was using at the time I could fire twice) and any possible inconsistency happening at the most inoppurtune time. That’s one of the reason I tried 209, whether or not it makes a difference I don’t know yet. Harvest looks like it’s going to run into late November this year if the weather keeps up like it has so I might muzzleload a little harder this year as I probably will miss rifle season. I might do some testing with the 209. I know that 777 falls off after about 10 rounds and while it will work, accuracy really suffers. If I could get 20 rounds with the same accuracy it would make sure that I don't have to clean the rifle throughout the season. I will however miss the pellets. Does 209 come in pellets? It does not, I preload mine in tubes, I weigh them out and put them in 209 tubes which are also graduated so you can load by volume. Following. Very interested to hear how the UML does. Well. First 15 shots were all over the place. 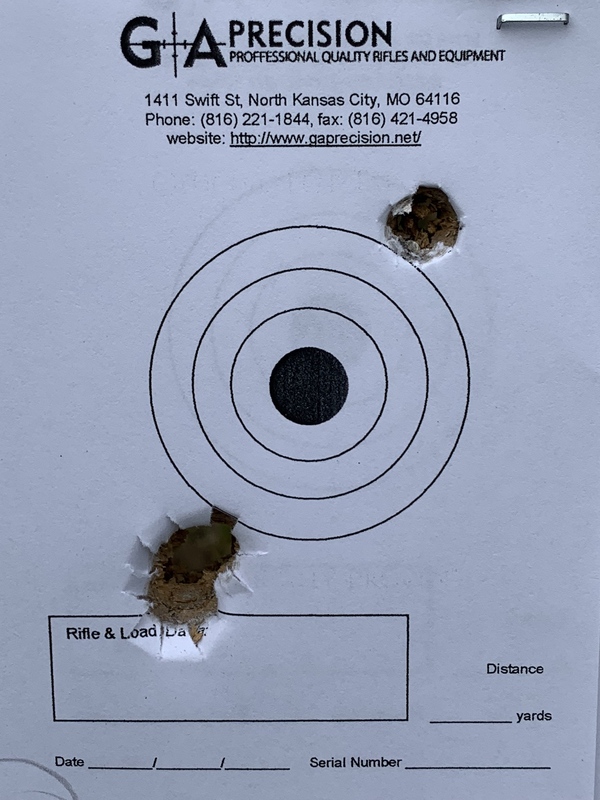 Three feet groups at 100 yards...just like it was with the maxim 50. The only variable that was the same was the scope, so after discussing it with Greg I took the mark 4 off and borrowed the S&B from my 40x. It then began shooting very well. Below is four shots, three in one hole and I pulled one. This stock is horrible for managing recoil and was making honest shots. I will change the stock before next year, but the rifle is capable. I ended up going with 150 gr of 777 and shooting the Remington branded 250 gr Barnes bullets. I probably also owe an apology to the maxim 50 as it likely would have shot better had the scope not been acting up. It was however a very low quality host muzzle loader though. I am also looking at getting the Ultimate. I wondered about that stock, what are you thinking? I don't like the stock. I have gotten too used to adjustable stocks. Even with low rings and a stock pack I still can't rest my cheek on the stock and see through the scope. Also, it is shaped in such a way that no matter how high I put my shoulder on the stock, it is still going to recoil up instead of straight back. 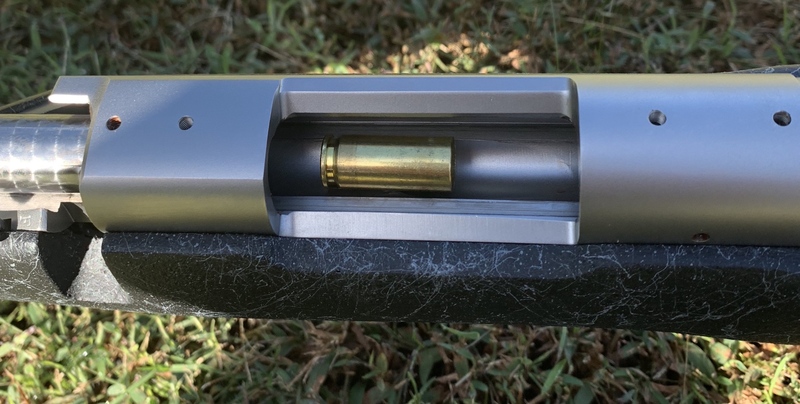 Now don't get me wrong, it is a B&C with a full length aluminum bedding block and with rod and barrel ring removed it is free floating, so probably about the best you can get with a factory, non-custom muzzle loader. however, I will probably put it in a chassis of some sort before next year. Have you had any success with it yet @dddoo7 ? Our muzzleloading season opened up last weekend but it was blizzarding out so I didn’t go. I didn’t shoot one with muzzle loader this year. I had a very good opportunity, but the deer only had one antler. I usually only hunt for meat, but we can only shoot two bucks in a year and i didn’t want to tie up a buck tag with that deer.